Hazrat Pir Syed Ghulam Muinuddin Gilani (Elder Lalajee) was born on Saturday, the 22nd May of 1920 (Ramadan 3rd, 1338 A.H.) at Golra Sharif, the then district Rawalpindi (now it is in District Islamabad, Pakistan). He was named as “Ghulam Muinuddin” by His Holiness Ala-Hazrat Syedna Pir Meher Ali Shah (R.A). Hazrat Pir Syed Shah Abdul Haq Gilani (Lalajee) was born on Friday, the 16th of April 1926 (Shawal 3, 1345 A.H.) at Golra Sharif, the then district Rawalpindi (now it is in District Islamabad, Pakistan). He was named as “Shah Abdul Haq” by His Holiness Ala-Hazrat Syedna Pir Meher Ali Shah (R.A). Both the Lalajees got their education from Qari Ghulam Muhammad Peshawari, the jurist and orator of “Dargah-e-Ghausia Mehria Golra Sharif”. The venerable Lalajees completed recitation of the Holy Quran on Monday, 17th of August 1936. Both the brothers initiated reading of Arabic books of Dars-e-Nizami from ocean of Islamic knowledge of the time, Hazrat Maulana Muhammad Ghazi, in the same institution. Elder Lalajee learned from him up to the chapters “Sharah Jami” and “Hadaya” etc. Both the Lalajees were fortunate to see the era of their venerable grandfather Ala-Hazrat Syedna Pir Meher Ali Shah (R.A). They used to go in the presence of His Holiness, daily, after Asr Prayer. Ala-Hazrat used to caress their heads with great affection and love and give his blessings. They used to remain in his company up to a short while before the sunset, and then returned to their home. The soul of Ala-Hazrat (R.A) departed the mortal body on Tuesday the 29th of Safar 1356 (11th May 1937 A.D.) at the time of his demise Elder Lalajee was of 17 years and Lalajee was of 11 years of age. Both the brothers took the oath of allegiance to the Ala-Hazrat Syedna Pir Meher Ali Shah (R.A). After the death of Hazrat Maulana Muhammad Ghazi in 1938, Hazrat Babuji selected Hazrat Maulana Ghulam Muhammad Ghotavi (Principal Jamia Abbasia, Bahawalpur), a sincere disciple and a renowned scholar, for accomplishment of religious knowledge of both the scions, Pir Syed Ghulam Muinuddin Gilani and Pir Syed Shah Abdul Haq Gilani. Accordingly both the Lalajees were admitted in Jamia Abbasia Bahawalpur in 1938 and were educated under supervision of the venerable Principal of the Jamia. Both the Lalajees walked towards their educational institution by carrying heavy books on their shoulders and never cared about weather changes. Distance between their residence and institution was around two kilometers. After getting education for seven years in Bahawalpur, elder Lalajee achieved supreme educational certificate of Allama and also passed the examination of Maulvi Fazil, whereas Lalajee got education in Sikandar Nama and from Sarf Ghotavi to Salam-ul-Uloom, up to 1944. His education was completed by the venerable Principal in the Holy Shrine of Golra Sharif. He says, “Hazrat Sheikh-ul-Jamia used to put in my mind the verses of Salam-ul-Uloom in such a manner similar to that way as the Holy Quran is learnt by heart by the honourable learner". He also got lessons of Mathematics by the honourable Sheikh-ul-Jamia. In spite of having all the resources, both the venerable Lalajees were obliged to travel from Bahawalpur to Golra Sharif in 3rd class compartment of Railway train, to make them habitual for endurance of all kinds of sufferings of a common man. Hazrat Babuji continuously taught them through his letters (sent to the Lalajees in Bahawalpur), with maxims and monitions, which were treasure of knowledge and wisdom and also a source for their sanctification and spiritual expansion. During higher education and training, both the Lalajees were passed through different stages of conciliation and both the brothers got through these stages with success and excellence. After completion of education of his sons, Hazrat Babuji always kept them in his company during travels as well as in residence. He took both the Lalajees and their teacher Sheikh-ul-Jamia for Hajj pilgrimage. It was first Hajj pilgrimage of both the Lalajees. Hazrat Babuji traveled through Turkey, Syria, Lebanon, Iraq and Holy Hijaz from 19th August 1949 to 1st November 1949 and then once again to Holy Hijaz, Lebanon, Syria, Jerusalem, Italy, Turkey, and Iraq from 15th April 1964 to 21 Saturday, June 1964. During these long journeys inter alia other loyal personalities both the Lalajees accompanied him. Elder Lalajee kept a record of all the travels in his diaries. Some extracts of these narrations have been published in “ Farmudaat-e-Musafir-e-Chund Roza” and “Zia-e-Meher”. They also went to pilgrimage of Holy places in Afghanistan in 1967 and 1971. Right from 1944 to last Hajj of Hazrat Babuji in 1973, they accompanied him, approximately every year. They also exalted from visit of Holy places in Baghdad Sharif (Iraq), Konya Sharif (Turkey) etc. After demise of Hazrat Babuji, both the Lalajees got honour of Hajj pilgrimage from 1975 to 1980 and of Umrah, almost every year from 1981 to 1996. During the period they also benefited by their presence in Baghdad Sharif (Iraq) and Konya Sharif (Turkey). The practice is still continued. Hazrat Babuji specially educated both the Lalajees in religious, ethics, spiritual education, public service, hosting the guests and following Shariah and Tareeqat, etc. Many a times in solitude as well as in the presence of others he specially awarded them with advice and perception. He always stressed them to keep a distance from self-conceit. He also emphasized them to be a true subservient of Ala-Hazrat Syedna Pir Meher Ali Shah (R.A). He also manifested them about their responsibilities regarding virtuals distributed to the poor and priory system. After demise of Hazrat Babuji on Saturday the 22nd June 1974 (2 Jamaadi-us-Sani 1394 A.H.), all responsibilities of Holy Shrine of Ghausia Mehria, Golra Sharif were laid on the shoulders of both the brothers (Lalajees). Both the Lalajees performed the matters relating to the Holy Shrines with great sobriety, exemplary unit and affection, in a very systematic manner and managed to prepare a comprehensive document for modus operandi for different affairs of the Holy Shrine. This document was registered in the office of Joint Sub-Registrar in Islamabad on 30th May 1996. This document has been published at Ghausia Mehria, Golra Sharif in a booklet named as “Aein-e-Dastoor”. They followed the footprints of Hazrat Babuji (R.A) and compiled with the rule of conduct and faith of Ala-Hazrat. Facilities for boarding, lodging and messing of pilgrims of the Holy Shrine were expanded. Magnitude of service, look-after and livelihood was enhanced for beneficiaries, believers and visitors, and many construction works were carried out. Under supervision of Lalajees, education of the Holy Quran, both reading and learning by heart, uttering of letters with reference to the organs of speech i.e. lips tongue, teeth, throat, and that of Dars-e-Nizami, is being imparted in Jamia Ghausia Mehria, Golra Sharif. After getting education from Jamia Ghausia Mehria, Ulamas are playing an important role by imparting education and preaching of the religion within the homeland and as well as in foreign countries. They enhanced the number of books relating to all fields of arts, in the library of Dargah Ghausia Mehria, which are proving as a great educational asset for students as well as researchers. The process of publication of literacy works of Ala-Hazrat Syedna Pir Meher Ali Shah (R.A), initiated by Hazrat Babuji, was continued and arrangements were made for their excellent printing. The letters sent by Hazrat Babuji to the Lalajees during their studentship in Bahawalpur, were compiled by Allama G.A. Haq Muhammad, and for the first time published by the Lalajees from the Dargah-e-Ghausia Mehria, Golra Sharif, with some definitions under the heading “Farmudaat-e-Musafir-e-Chund Roza”, on 1st Jamaadi-us-Sani 1417 A.H., which are source of achieving destination by the seekers of the right path. Following the practice of Hazrat Babuji, Lalajees continued holding of congregation daily from 11:00 am to 12:00 noon for recitation of religious poems praising Allah, the Holy Prophet (P.B.U.H) and the pious saints of Islamic world. Mahboob Ali Qawwal (Andleeb-e-Rome) offered mystic poetry in composition. Such a practice is continued hitherto. It was a usual of Hazrat Babuji to go to Chawla Garage (Mall Road, Sadder, Rawalpindi) from Golra Sharif daily after Asr Prayers and took both the Lalajees with him. In this evening gathering renowned scholars and their appurtenance pondered over literary and spiritual topics. After Isha Prayers they returned to Golra Sharif. After the demise of Hazrat Babuji, they maintained it and with the grace of God it is continued hitherto. Hazrat Babuji had, long before his demise, allowed both the Lalajees, to accept allegiance from the believers and to advise them. During his lifetime, Babuji (R.A) had imparted complete spiritual knowledge, and training in spiritual discipline to his two sons, Elder Lalajee Pir Syed Ghulam Muinuddin (R.A) and Lalajee Pir Syed Shah Abdul Haq. After his passing away, they assumed these duties. Elder Lalajee Pir Syed Ghulam Muinuddin told Ismail Sethi that while they were once going with Babuji (R.A) in a car to Peshawar, he directed them to enroll in bai'at any person who himself wanted this, but never to think themselves to get anyone enrolled, otherwise it would have an adverse effect. 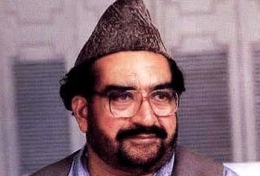 Syed Ghulam Muinuddin said that he wanted to request Babuji (R.A) to take responsibility for such persons but kept quite lest Babuji (R.A) may feel that an effort was being made to copy Babuji (R.A) who had expressed similar thoughts when Hazrat Syed Meher Ali Shah (R.A) had directed him to enroll persons in Bait. A person hailing from Gujrat once request Babuji (R.A) to direct Shah Abdul Haq to enroll him in bai'at. Pir Syed Shah Abdul Haq was asked by Babuji (R.A) to do so but he expressed his regrets. Babuji (R.A) took Pir Shah Abdul Haq’s hand, placed his own hand above all. It was out of sheer reverence and extreme regard that both the sons were not willing to enroll people in bai'at. After Babuji (R.A), took the responsibility the enrollment duly took place. After the death of Babuji (R.A), Syed Abdul Qadir Al-Gilani visited Golra Sharif and honoured Syed Ghulam Muinuddin and Shah Abdul Haq to bestowing ceremonial roles on them at the Mausoleum as an insignia of the spiritual successors of Babuji (R.A). A great majority of people accepted featy from them. Hazrat Pir Syed Ghulam Muinuddin Gilani was a graceful man of principal. He always spoke the truth, taught about promoting good and forbidding evil. He passed his whole life in total dedication to Allah following the Sunnah of the Holy Prophet (P.B.U.H), serving the suffering humanity and teaching the right path to the disciples. He had a great inclination towards beseechment of religious knowledge and mysticism. He was a silent preacher and a true apparent as well as latent portrait of his ancestors. He struggled for unity of the faithfuls. He portrayed as a guiding lighthouse for Islamic world. He disseminated the teachings of the Saints and always opposed sectarianism. He was honoured and respected by all walks of life. Like his forefathers, he affectionately and lovingly nurtured the suffering humanity. He spiritually trained his followers and adopted a simple way of life. He was a combination of virtues and noble properties. Throughout his life he struggled for implementation of the system endowed by the Holy Prophet Hazrat Muhammad (P.B.U.H). Even during his sickness, lying on bed for departure to journey of eternal rest, through a letter, written to the then Prime Minister Mian Nawaz Sharif, he emphasized for implementation of the system of Holy Prophet (P.B.U.H) in Islamic Republic of Pakistan. The letter was sent with the signatures of both the Lalajees. This was the last signature of the Elder Lalajee. Complete implementation of Statutes of the Holy Prophet Muhammad (P.B.U.H) was his dream. Affection for the Holy Prophet Muhammad the Arabic (P.B.U.H) was present in every part of his body. He often listened to Qaseeda Burdah Sharif (By Hazrat Sharfuddin Abu Sabri). His whole life was adorned by love for Hazrat Ghaus-us-Saqlain Muhyuddin Abdul Qadir Jilani (R.A), Hazrat Khwaja Gharib Nawaz Muinuddin Chishti Ajmeri (R.A), Hazrat Maulana Rome (R.A) and other pious saints. He had a great taste for poetry. He wrote the verses in Urdu and Persian languages. He was a swift and splendid poet. His nom-de-plume was “Mushtaq”. His writings have dominance of ecstasy and affliction. His poetic work titled “Israr-ul-Mushtaq” was published after his death, by his brother Hazrat Pir Syed Shah Abdul Haq Gilani (Lalajee) for the first time on 1st of Zi'qad, 1418 A.H. This work includes poems containing praise of Allah, His Holy Prophet (P.B.U.H), virtues of the Holy Saints and Odes. Hazrat Babuji (R.A) liked his poetry. His verses were often recited in the congregations, which provided exhilaration to the listeners. After protracted illness he welcomed eternal and supreme command on Wednesday, the 12th of March 1997 i.e., 2nd Zi'qad 1417 A.H at 04:20pm. The news of his sad demise was released by Radio Pakistan and Pakistan Television through special bulletins at 08:00 pm. The details were given by the Pakistan Television during “Khabar-Nama” at 09:00pm. At around 10:00am, his funereal was brought from seraglio and placed at covered Throne in courtyard of Guest House No.1, just opposite “Ishq-Abad” residence of Ala-Hazrat, so that general public could benefit by its sight. After Asr Prayer, the funeral was taken in an ambulance, towards an open ground at a distance of around one-kilometer because due to heavy rush and affectionate gathering of people, it had become impossible to carry it on a cot. In the “Namaz-e-Janaaza”, religious Scholars, Saints, descendants of Saints, the then Prime Minister of Pakistan Mian Muhammad Nawaz Sharif, Federal Ministers, Senators, Members of National and Provincial Assemblies, Political figures, judges of District and Superior Courts, Civil and Military officers and people belonging to different walks of life also participated. Believers from abroad also reached Golra Sharif for participation in Namaz-e-Janaaza. Maulana Faiz Ahmad Faiz, Khateeb and Mufti of Jamia Masjid, “Dargah Ghausia Mehria Golra Sharif” led the Janaza Prayer. The funeral was brought back in the Shrine in the same ambulance. It was a subtle sight. The atmosphere was filled with sobbing and sighing sounds. Recitation of Kalma-e-Shahadat and benediction continued. After Maghreb Prayers, his mortal body was laid to rest towards south of the tombs of his grandfather Ala-Hazrat and father Hazrat Babuji. On every marble stone fitted in the grave, complete Holy Quran was recited. His tomb is an asylum for all. “He, whose heart is alive with love, never dies. It’s leaf is imprinted with our eternal life”. The news of his demise was printed in newspapers in headlines and the daily newspapers and magazines published columns, articles and essays about him. Condolences messages from President, Prime Minister of Pakistan, Provincial Governors, Chief Ministers and other dignitaries were published in the newspapers. Religious Scholars of every sect, Saints from every link of chain of spiritualism, the descendents of the saints, the dignitaries, and people from every walk of life came to his real brother Hazrat Pir Syed Shah Abdul Haq Gilani for condolence. 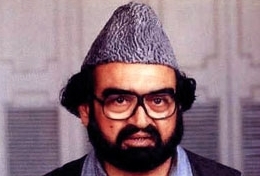 On the pronouncement of Nazim Ala, Tanzeem-al-Pakistan, its all attached religious institutions remained closed on 13th of March 1997 mourning over his sad demise. Majority of the commercial centers located at Rawalpindi and Islamabad also remained closed on the day. Recitation from the Holy Quran, Seminars, National, religious and literary references, were held in mosques, National centers and other places of importance, throughout the country to pay homage to his services for the nation and the religion. On every Thursday, up to his chehlum, after prayers for eternal peace and rest of the departed soul, thousands of people were fed at the Shrine. His chehlum was held on Monday the 21stApril 1997, i.e., 13th of Zilhaj, 1417 A.H. Majority of the newspapers published his biography on the day and some of them also published special supplements. His death anniversary is celebrated at Dargah Ghausia Mehria, Golra Sharif, on 2nd and 3rd Zi'qad every year, whereof millions of the affectionates reach to pay tributes. Elder Lalajee, Hazrat Pir Syed Ghulam Muinuddin Gilani was married within his own clan. Allah bestowed him with three sons. Hazrat Babuji (R.A) named them “Ghulam Naseeruddin”, “Ghulam Jalaluddin”, and “Ghulam Hissamuddin”. Hazrat Pir Syed Shah Abdul Haq Gilani (Lalajee) was married in the Holy family of descendents of Hazrat Baba Fariduddin Masood Ganj Shakar (R.A) of Pakpattan Sharif. Allah bestowed him with two sons. Hazrat Babuji (R.A) named them “Ghulam Moin-ul-Haq” and “Ghulam Qutb-ul-Haq”. After demise of Hazrat Pir Syed Ghulam Muinuddin Gilani, heavy burden of matters and thematic engagements relating to Dargah Ghausia Mehria Golra Sharif has been laid on his shoulders, which is very gracefully being accomplished by him, by the grace of God. He proceeds to Harmain Sharifain every year for pilgrimage. He arranges all ceremonies with great affection and sincerity during the whole year as usual and takes complete care of respite and relief of all the guests. The practice of imparting religious education initiated during the era of Ala-Hazrat Syedna Pir Meher Ali Shah (R.A) is still continued under his supervisions, so that maximum people could benefit from propitiatory offerings established by his ancestors. He passes through an ecstatic situation during listening to Qawwali, but controls it with great perseverance, so that the audience could not get a touch of it. With the grace of God he is clairvoyant having ancestral grace and perfection. He manifests all the excellence and virtues, which are distinctive features of Mehria family. He is arbitrator of sect and path of his venerated grandfather Ala-Hazrat; as his words have a tranquilitive effect likewise his benedictions have great inference. May Allah with the grace of his beloved Holy Prophet (P.B.U.H), keep his shelter for procrastinated periods, over the heads of all the disciples (Amen). Website Developed By: Altaf Ahmed & Sons.